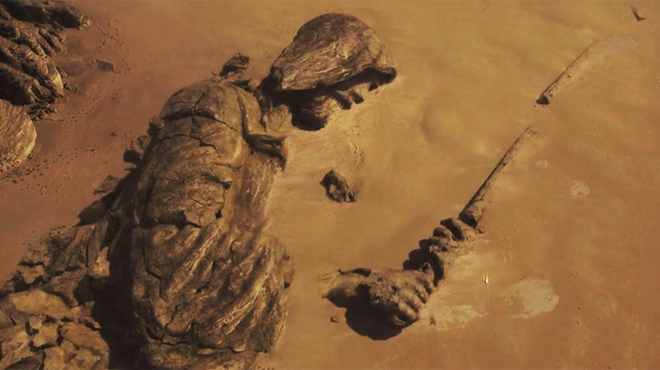 In the Rogue One trailer, we see a scene on Jedha, with a gigantic statue fallen down to the ground, half covered in sand. Who did the statue represent? Why was the statue originally sculpted, and why was it taken down? Was the character a member of the Jedi Order, or another Force cult? Was the statue destroyed prior to the establishment of the Empire and Order 66, or later? Who was it destroyed by? Were there more of these statues, in addition to this one? 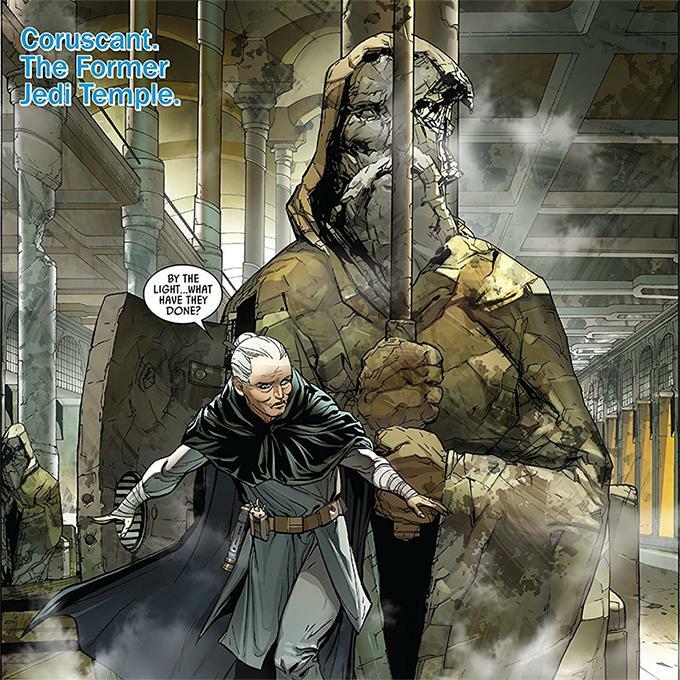 EDIT: In the comic book Darth Vader: Dark Lord of the Sith 8: The Dying Light Part 2, Master Jocasta Nu returned to the former Jedi Temple on Coruscant to rescue a holocron. She entered the Archives through a secret passage within a smaller version of the similar-looking statue. Additionally, the same figure was repeated on the door of the passage. This event occurred around 19 BBY, which reveals us, the Jedi Order had transferred at least one of the statues from Jedha to Coruscant – assuming they were of the same origin. It also tells us, that they had left the bigger one lying on Jedha for a reason, since it was still on the moon in 0 BBY (and got destroyed). The condition of the smaller statue indicates it may have been as old as the big one still on Jedha, even though the Archives had gone through some serious devastation by the Empire and the Inquisitorius. EDIT: There were statues just alike on Ilum, too, as seen in the episode The Gathering of the Star Wars: The Clone Wars television series. Thinking about what Ilum and Jedha had in common leads us to the Kyber crystals. Might that be a clue...? This is likely one of a group of statues called "The Three Faces" (at least by former Guardians) which are old monuments related to the Jedi / various Force religion activity on Jedha. "The old monuments", Baze said. "The Three Faces." Baze grunted. "The desert has eaten at their features. One is a man, I think human. Another, I cannot tell, but from what remains of the body, perhaps a woman. The other species I do not know. Perhaps Duros, once upon a time, before the sand and the wind did their duty." It is the remnants of an old Jedi temple that most likely fell to the ravages of time and looting long before the empire existed. This is exactly why the empire was there, to loot the old Jedi temples for kyber crystals to power the death stars weapon. They do show that exact fallen statue in rogue one it's just not as close up. I'm not sure if the statue represents a particular Jedi but I'm guessing it stood outside the temple as a symbolic guard probably with another one on the opposite side mirroring it. Not the answer you're looking for? Browse other questions tagged star-wars jedi the-force rogue-one or ask your own question. Why did the Sith Empire propose the “Treaty of Coruscant” after capturing Coruscant? Was the idea of pre-Empire Old Jedi Order members not being allowed to marry mentioned in before-prequels EU books? What were the immediate death tolls of Order 66?